Celebrate the magic of the holiday season with a festive journey along the Danube River. After boarding your ship in Nuremberg, you will cruise through the charming region where so many of today’s most beloved Christmas traditions originated. Experience a number of enchanting Christmas markets in places such as Regensburg, Salzburg, and Vienna, each with its own local flavor and traditions. Conclude your holiday cruise in Budapest. Board your cruise in Nuremberg. Tonight, gather on board your ship for a Welcome Dinner. The ship will moor overnight in Nuremberg.. Enjoy a guided morning tour of this historic city with its fabulous Gothic churches, 900-year-old city ramparts, the house of artist Albrecht Dürer, Imperial Castle, and the Justice Palace courtroom where the War Crimes Tribunal sat in 1946. Following your tour, you will have free time to visit the city’s fabled Christmas Market and enjoy some hot mulled Glühwein – the souvenir mug is yours to keep! Arrive in Regensburg after breakfast and enjoy a guided walking tour of this exquisitely preserved medieval city. Marvel at the beautiful churches, the homes of wealthy families, and one of Germany’s oldest bridges across the Danube. 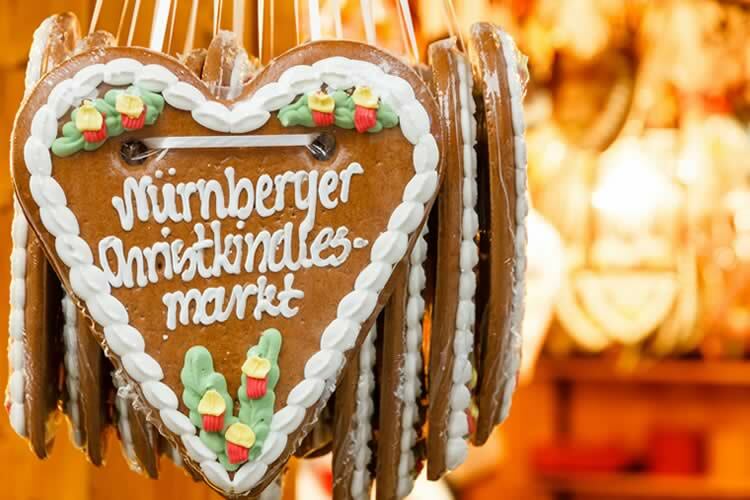 Your tour ends with a visit to a Christmas Market, with its festive stalls adorned with fir branches. This evening, you will enjoy a visit to the exclusive “royal” markets at the Thurn and Taxis Palace, a very traditional handicraft Christmas Market where you can watch craftsmen at work. After breakfast, you have three choices for how to spend the day. The first is a walking tour of picturesque Passau, a fairytale city founded more than 2,000 years ago, known for its fortifications and town squares like Rathaus, Domplatz, Residenzplatz, as well as St. Stephen’s Cathedral, home to Europe’s largest pipe organ. Afterwards, take some time to explore the town’s Christmas Market. Guests looking for a more active morning may instead join a guided bike tour from Passau to Erlau. Your third option is a full-day excursion to Salzburg, birthplace of Wolfgang Amadeus Mozart and the setting for “The Sound of Music.” You will have time to visit Salzburg’s beautiful Christmas Market, renowned for local handicrafts and one-of-a-kind holiday presents, as well as a stop at the Christmas Market in Linz on the way back to the ship. Today’s guided walking tour takes you to Melk’s magnificent 900-year-old Benedictine Abbey, one of Europe’s largest Baroque monasteries. You will see the famous library that inspired novelist Umberto Eco to write The Name of the Rose. You may also opt for a guided bike tour along the scenic Danube instead. During lunch, the ship cruises through the romantic Wachau Valley en route to Vienna, the “City of Music,” arriving this evening. You will have the chance to visit both the Maria Theresienplatz and Rathaus Christkindlmarkt markets tonight. The ship moors overnight in Vienna. This morning, you will have a chance to savor the Baroque elegance of Romantic Vienna through your choice of one of two different excursions. The first option is a panoramic tour of Vienna that guides you past the majestic Opera House, the former Imperial Palace of the Habsburg Emperors, Parliament, Town Hall and Vienna University. Afterwards, you will visit Vienna’s historic city center, a UNESCO World Heritage Site, and see St. Stephen’s Cathedral, Graben and the world famous Spanish Riding School. The second option is a walking tour of Vienna’s hidden treasures that takes you to secret places and sights like Ankeruhr, a whimsical Art Nouveau clock. Afterwards, spend some time enjoying the Christmas Market and holiday festivities at the Town Hall. Later, you can visit the Schönbrunn and Karlsplatz Christmas Markets, or join a guided bike ride to Klosterneuburg Monastery. The ship departs late this evening for Hungary. Your morning excursion includes sightseeing in the cities of Buda and Pest spread over both banks of the river. You will see famed Heroes’ Square and Castle Hill, home to Fisherman’s Bastion, Matthias Church and spectacular views of the Danube. Afterwards, take some time to explore the twinkling Christmas Market in the main square. After dinner, the ship will sail a special Illuminations Cruise past the city’s glittering riverfront. The ship moors overnight in Budapest. This morning, depart the ship after breakfast and transfer to the airport for your flight to the UK.